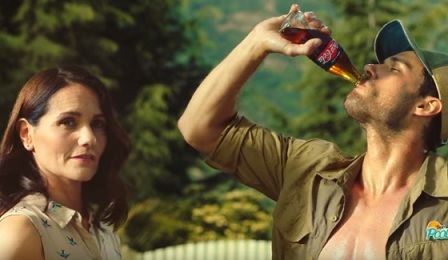 Coca-Cola has released a hilarious new commercial, described as “representative of the brand’s overall stance on the LGBTQ community and other minority groups”, and illustrating, at the same time, the idea that where two are fighting, the third wins. The 30-second spot features two teenage siblings, a brother and a sister, ogling from inside the house the handsome pool boy, who’s showing off his six-pack abs while doing his job. Imagining that he might be thirsty, given the hot weather and his sweat, they both set out to give him a refreshing bottle of Coke, taken from the fridge. The path leading to him, though, proves to be hard, as the siblings start a race/fight to be the first one to reach the guy and quench his thirst. When they get outside, surprise: the pool buy is already drinking a Coke, offered by their mother. The company’s spokeswoman Kate Hartman stated that the ad is “a representation of the company’s stance on equality”, mentioning that they strive for “diversity, inclusion and equality” in their business and support these rights in society through their work. The song playing in the background is “Come Prima” by Tony Dallara.